The authenticity and protection of copyrights against knock offs are two of the most discussed tapeworms in fashion today. When scrutinizing in the history of fashion, we can understand and soak the authorized or unauthorized copies, as well as the various factors that were brought to the gray areas of authenticity. For decades, designers have carved and implemented brilliant and diverse initiatives to stop the counterfeiting of their designs; such as the case of Madeleine Vionnet, who decided to mark her fingerprint on the labels to authenticate each one of her creations. Similarly, in an effort to combat unauthorized copying during the 1930s, the Originators of Fashion: Guild of America, trademarked the work of various designers. When the haute couture industry began to stabilize again after World War II, the struggle intensified. Therefore, the Chamber of Commerce of Haute Couture struggled to maintain the exclusivity of haute couture with the promotion, through press coverage and licensed copies. During the 1950s, designers thought of their designs with the intention of directing them to department stores for the purpose of producing licensed copies of their couture suits. Part of that group was Gabrielle Bonheur, also known as "Coco" Chanel, who once said, “Fashion should slip out of your hands. The very idea of protecting the seasonal arts is childish. One should not bother to protect that which dies the minute it is born." The Museum of the Fashion Institute of Technology in New York exposed two costumes of the year 1966, an original Gabrielle "Coco" Chanel and a licensed copy of it, plus a video with side-by-side comparisons of costumes. 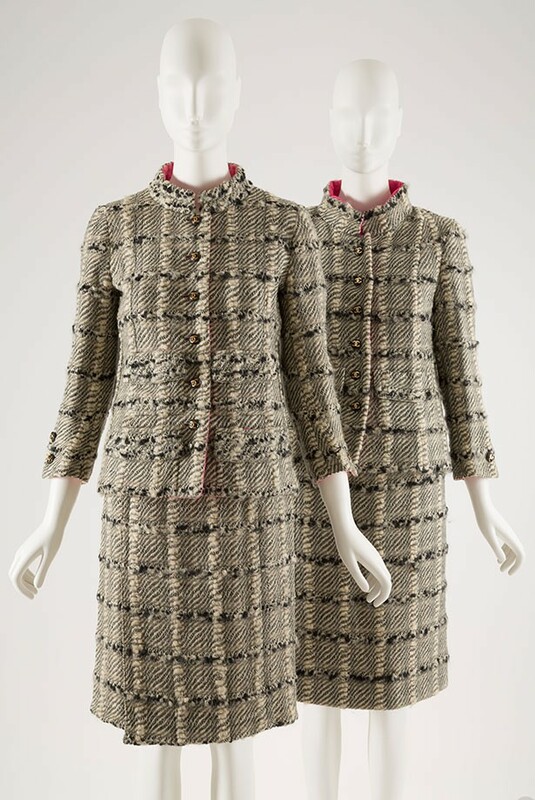 The perspective of this designer was so wide and her tweed suits were so recognizable that she simply saw copies of her designs as a form of advertising. Since 2011, the Council of Fashion Designers of America has partnered with eBay with an initiative called "You Can’t Fake Fashion" to educate shoppers about the dangers of counterfeiting and design protection original and integrity of the fashion industry, as established by Steven Kolb, executive director of the CFDA. About 90 prominent US designers support this cause, by presenting at New York Fashion Week Spring Summer of 2013 a collection of one-of-a-kind and personalized bags that are sold exclusively on eBay with all profits benefiting the Foundation CFDA. In addition, eBay, seeking to keep the market free from counterfeiting and combat the global problem, has implemented the elimination of items reported as counterfeits by trademark owners. Proactively removing suspicious items and providing free tools for right owners to identify and report articles. They are also working closely with the police to prosecute criminals. On eBay, a designer bag is sold every 4 minutes. eBay Fashion offers a wide selection of authentic fashion at great value, ranging from big luxury brands to young emerging talents, plus exclusive collections of designers such as Narciso Rodriguez, Derek Lam, Alexander Wang and Rebecca Minkoff. To the annoyance of many and benefit of others, the 1990s ushered in the era of flagship mania and mass production of counterfeit goods. Louis Vuitton, Gucci, Chanel, Christian Louboutin and many more top the list. But how can you really detect a forgery? "Ha! That is the million dollar question! Or should I say the $50-$200 question depending on the item! That is more or less the cost for a guaranteed authentication by me," said to Latin Times Lorena Shiff, founder of Lorena’a Worth, one of the top luxury resale destinations in the country with Lorena personally involved in every aspect of the business. "Price. If the price is too good to be true, then you know the answer. Real bags are never ever cheap! Yes, used items are cheaper than new ones but if it's a 90% percent discount that should raise some flags," said Shiff. "Use your judgement. There are good deals out there, make sure you choose the right ones!" Keeping your reputation as a consumer is based on experience and knowledge, but as it increase, technology makes the struggle to surpass giving us low blows and making us hesitate to detect an original from a good counterfeit. After decades of work experience, 4 patents and thousands of hours of research and testing, "Entrupy" is born. Their complex techniques of detection of material range from canvas, leather, cloth, wood, paper, metal among many others. A database of more than 1,000,000 reference samples ensures that each bag being authenticated is covering accuracy, a 99% result in veracity in tests. Using it is fairly easy. When placing the device in the bag in question, we must push a button on the smartphone and following this, you'll know the result in just 15 seconds. "I personally do not think there is a person out there who follows trends and only buys knock offs. I do not think it works this way. Maybe I don’t know? Maybe! But I do not think so," said the expert when we asked what she thinks of the people who want to follow the trends but only buy the knock offs. "Most people buy their clothes and shoes at the mall/stores that do not even sell knock offs per se, as its illegal, but are on trend. You tell me - if you buy a BeBe purse that looks like a Chanel Le Boy at the local mall – is that a knock off? Is that a trend? Fashion? Where do you draw the line? Now - What do I tell people that buy knock offs purses/wallets, illegally? To that I would say simply do your homework, learn the trends, know the selling and re selling markets," said Lorena. "You will easily realize you can buy one good purse, pre loved or on sale, for the value of all those knock offs, that fall apart in a day, that can go with all your outfits at day and night, lasts forever and that will give you real bragging rights." Lorena also suggests to buy only from reputable sellers and/or that offer a secured and guaranteed money back no questions asked! Entrepreneur Lorena Shiff captivated global attention from fashion designers and shoppers for her astute luxury knowledge and experience. You can contact her here.